This time of year, many people notice how abundant goldenrods are in our open areas. Since this coincides with many people getting hay fever allergies, they wrongfully blame the goldenrods they notice, rather than the ragweed and other real culprits that they don't. Showy flowers such as goldenrods have larger and heavier pollen that is transferred by pollinators such as insects. Wind pollinated plants do not need showy flowers since they need not attract any pollinators, but need to produce an abundance of light weight pollen in the hopes some of it is carried onto another flower. Those plants, especially ragweeds, are what cause the issues this time of year. Goldenrods are an important and abundant Fall flower. Many animals depend on them. We have close to 50 species in Virginia alone, so they're adapted to many growing conditions, but most favor open, sunny locations. Due to their adaptability and showiness, many goldenrods are garden staples, both here and in other countries. 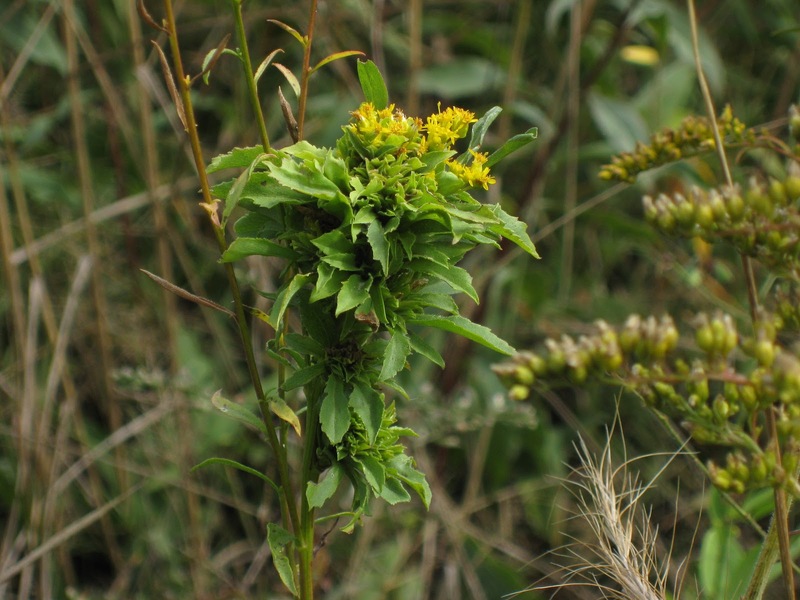 In some parts of the world however, due to their adaptability, North American goldenrods have the potential to become invasive. They have some allelopathic traits, exuding chemicals that inhibit the growth of certain plants (such as maples) that also help them compete. The Genus name "Solidago" translates to "making whole" and points to worldwide use of this plant group for many medical and other uses. In North America, famed ethnobotanist Daniel Moerman listed too many uses by native peoples to cover here. I will mention just a few for one of the most common species, Solidago canadensis, Canada Goldenrod though: The Iroquois used it for such various things as treating body pains, using the roots as an emetic to induce vomiting, and even to assist in getting better luck, deeming it "gambling medicine" as did the Navajo. The Potawatami used the blossoms for dealing with fevers. The Zunis chewed the flowers when they wanted rid themselves of a sore throat. The Shuswap believed a bath made from goldenrods could assist a mother at childbirth. The Meskwaki believed it could be used as wash for children who did not talk or laugh. The Thompson used it for everything from treating diarrhea, to using it in steam baths for treating paralysis and cripples, to using it to treat cuts and sores on their horses. Francis Porcher, a Confederate doctor charged with finding local sources for medicines no longer available during the Civil War, also found uses for it. He wrote that it could be used for cordage, making usable rope. He also said it made for a medicinal tea and a valuable dye. In Europe, their species had long been used. According to folklorist Jack Sanders, it was greatly revered. He noted that herbalist Nicholas Culpeper called it a "sovereign wound-herb, inferior to none" and that English herbalist Donald Law deemed it "as much a panacea as any plant could be." More fanciful uses were attributed to it by diviners and witches. Thomas Edison was a big believer in goldenrod use. He experimented and succeeded in making rubber from certain Solidagos. He even bred his own type that grew to twelve feet tall to maximize the rubber compounds. Henry Ford even gave him a Model T with tires made from his goldenrod rubber. 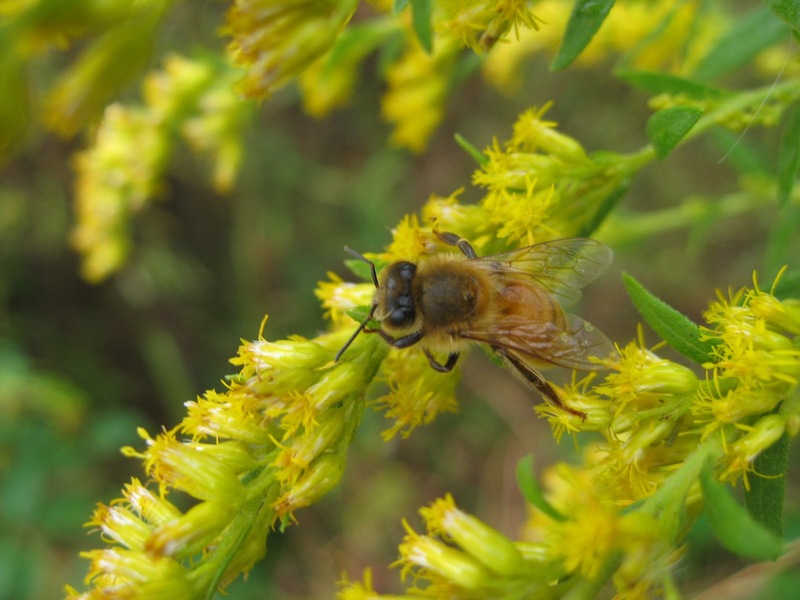 European Honeybees make great use of goldenrods this time of year, benefiting us with honey. Of course, it is wildlife that have the most uses for goldenrods. In addition to feeding on the many insects that use Solidagos (see below), birds such as goldfinches, juncos, pine siskins, trukey, indigo buntings, and various sparrows all feed on the seeds. Despite the chemicals in them that made them such sought after medicinal plants, mammals such as rabbits, voles, mice, beaver, muskrat, groundhogs and deer (although others consider it deer resistant) all make use of it. Insects make the most use of them (and feed such things as birds and bats in the process). 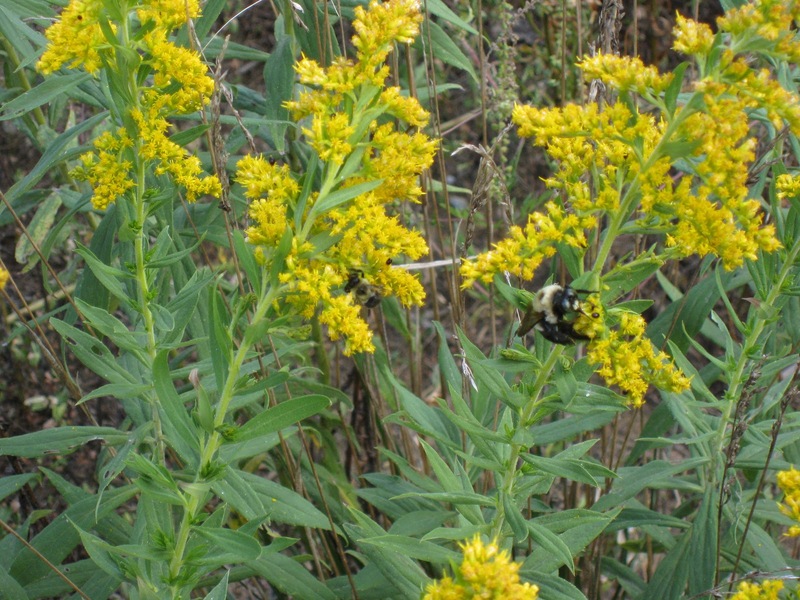 A study in 1996 found 103 species that fed extensively on Tall Goldenrod (Solidago altissima), while another on Canada Goldenrod (Solidago canadensis) in 1948 collected 241 insects on it over a year. Over 13 species of grasshoppers favor them, as do 16 bug species, 9 aphids, 7 leaf hoppers, and countless beetles (including 15 leaf beetles). Caterpillars numbering 115 different species have been documented feeding on goldenrods (and which then of course become the main prey of birds and bats). Tons of pollinators visit the flowers, including 7 bee species that are oligolectic, requiring that specific pollen in order to be able to reproduce. One species for example, Andrena solidaginis, even has Solidago as part of its name to show how necessary it is for its survival. There are several galls that are particular to goldenrods also. These in turn have certain resident and parasites that will also live in them. Goldenrod Bunch Galls are caused by a specific gall midge, the Cecidomyd midge Rhopalomya solidagnis. Note that its scientific name contains the genus Solidago, showing how they live no where else. 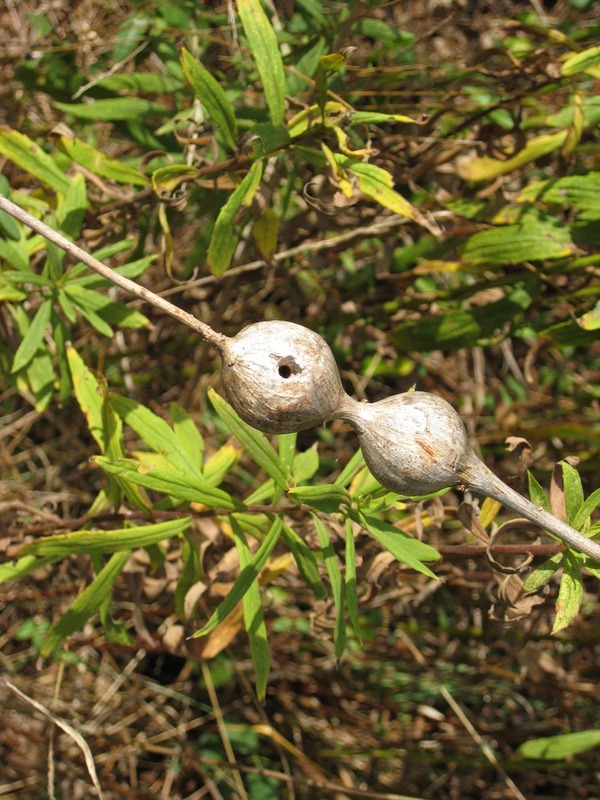 The Goldenrod Round Gall is caused by the tephritid fly Eurosta solidagnis, in our area usually restricted to either Tall or Canada Goldenrods. One of these has been raided and now has a hole in it, likely helping to feed a chickadee or downy woodpecker over the winter. Elliptical Goldenrod Galls are formed by 2 kinds of moths. This one is open and so may have emerged already. As you can see, goldenrods are extremely valuable plants and deserve to be included in our gardens and landscapes, not simply because of their beauty and adaptability, but for the wonderful wildlife value they have. There was even a movement to make goldenrod our national flower in the late 1800's. It has had to settle for being the state flower of both Kentucky and Nebraska, and the state wildflower of South Carolina. 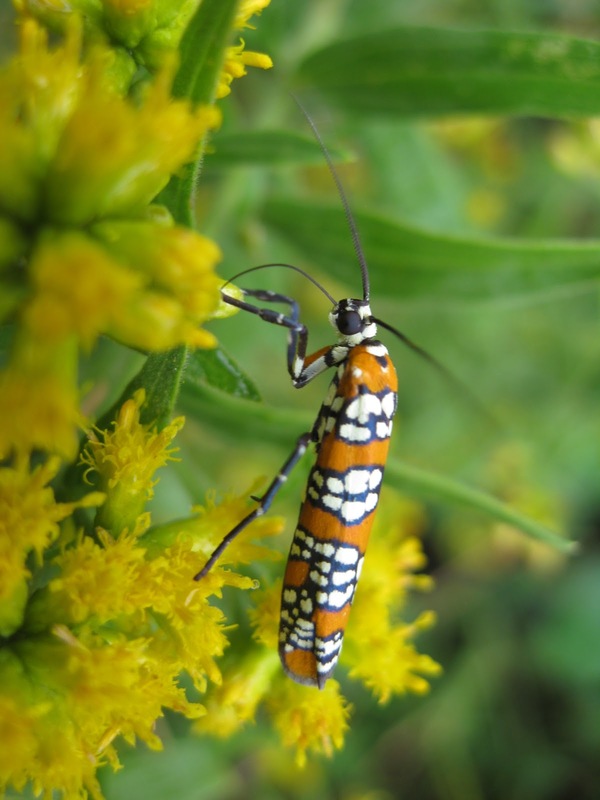 Long-horned Locust Borer beetles, yellowjacket mimics, love goldenrod. They eat the pollen, pollinating it at the same time. They often kill 2 birds with one stone, mating while feeding on the goldenrod. Daytime flying Ailanthus Webworm Moths are often found nectaring on Goldenrods. More on them here: http://capitalnaturalist.blogspot.com/2014/09/ailanthus-webworm-moths.html. Migrating Monarch and Buckeye Butterflies (such as this one) find goldenrod blooms to be life savers on their travels. Several very similar looking wasp mimic moths are commonly found sipping nectar on goldenrods, such as this Yellow-collared Scape Moth. 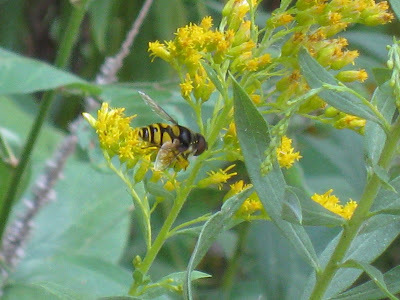 Numerous Syrphid or Flower Flies favor goldenrods, most being excellent bee and yellowjacket mimics. Bees love goldenrods, like this bumblebee and its larger carpenter bee cousin. So the next time you pass a Goldenrod patch, do more than smell the flowers (though you can at least do so with out fear of allergies). Stop by and conduct a little safari, trying to see how many different animals are using them. Bald-faced Hornets (Dolichovespula maculata) have a mostly undeserved reputation for being vicious, pests and safety hazards. They are actually fairly beneficial insects with a role in the environment. Sometimes called White-faced Hornets, Bull Wasps, or Blackjackets, these wasps are actually not true hornets, but large aerial yellowjackets. They mostly go unnoticed and cause no issues until suddenly someone becomes aware of their large paper nests and get scared. Now these insects, which have been living in that same place throughout the earlier part of the spring and summer causing no trouble, are seen as a danger and something to be feared and destroyed. The typical paper nest we often do not notice until late in the season or when the leaves have fallen from the trees. Most of the time, Bald-faced Hornets are actually beneficial. They hunt other insect prey (including some pests) and bring them to feed themselves and their developing young. They predate on quite a few insects, considering that a nest can hold 400-700 workers by the end of the season. Interestingly, one of their favorite food items are their smaller cousins, Yellowjacket wasps. They also serve as minor pollinators (particularly late in the season when they visit more flowers to obtain nectar and hunt less since they have less young to feed). A Bald-faced Hornet worker visits a plum flower. A typical nest starts when an overwintering queen wakes up in the spring and finds a likely location to start her nest. Though most of the time they choose a location in a tree from 2'-60' high, they sometimes will use the eaves of a building or other structure that might give some cover from the elements. The queen chews some wood fiber, mixes it with saliva, and then shapes it into the first hexagonal paper cells that will house her eggs. Each egg takes about 6 days to produce young. She feeds and cares for these, who then become the first workers and will raise, provide, and protect the young until the end of the season. A new paper nest is quite small and has the opening at the very bottom. A small paper hornets' nest at the beginning of the spring. By late summer or early fall, the queen starts laying male (drone ) and future queen eggs. Unfertilized eggs become male. The new queens tend to be larger and are hairless (unlike the female workers who have very short "hair" (setae)). Egg production starts to taper off, and eventually there are no more workers or reproductive eggs laid. The old queen dies (some say that in some cases, the workers kill the no longer useful queen). All but the new queens after mating will eventually die off, usually by the time they get a couple of hard frosts. The old nests are durable, easily visible in the winter when the leaves are not around, but start to rot away, with no workers to repair or lap them dry after storms. Nests (except maybe a very few in the deep South) are not used again. An overwintering Bald-faced Hornet queen. Sometimes nests do become a safety hazard where they might cause issues with people. This is normally when the nest is too close to habitation or where people can bump into them. When this happens, the nests do need to be destroyed, as they cannot be safely moved. This is best done by a professional. If someone does decide to try and eliminate a nest on one's own, please do so with caution and not use such ridiculous tactics as burning them. This should be done at night (when they're all home, sluggish due to lower temperature, and trapped inside) using one of the commercial hornet sprays. A flashlight may help to find the nest initially, but should be placed away from the person spraying or turned off so as to not give the workers a target if they come out in defense. The spray should be aimed directly into the opening, not only to get the pesticide inside and not hit unintended targets, but to also to help prevent them coming out against the stream of the nozzle. A Walnut Caterpillar. You may be able to notice where it spit up on my hand. The Walnut Caterpillar (Datana integerimma) is a neat caterpillar with a mixed reputation. One of 13 species of what are sometimes called the Handmaid Moths, the Genus Datana, they can be difficult to tell apart. They all are very social, at least while young caterpillars, forming large groups. When disturbed they also all have an interesting defensive posture. They all in unison lift both ends of their bodies and arch themselves upwards. They may also regurgitate onto anything that attempts to grab them. Older caterpillars sometimes just let go and fall to the ground. A Walnut Caterpillar starting to give the typical defensive posture of the Datana moths. The Walnut Caterpillar is much easier to tell apart than the others, lacking much of the markings the other members of the family have that make them all look so similar. They do indeed feed on walnuts, hickories, and pecans (some claim they feed on a few other species, but that's debatable). This can lead to their being considered agricultural pests, though that's more of an issue in the South where they can have multiple broods and defoliate production trees. In our area and further North, they only have one brood and so usually are not as much of a problem and the trees recover well. They are also a favorite food of many animals, so their numbers are usually kept in check. These caterpillars have what maybe a unique behavior as well, that even other members of their Genus lack. They all molt, shed their skins each time they grow, in unison. Even caterpillars born at different times and of different sizes, all somehow synchronize it so they all shed their skins at the same time and in the same place. This usually results in a huge pile of caterpillars and then left over skins, in what may resemble a big hair ball, in the crotch of the tree. The remains of the synchronized molt of the Walnut Caterpillars in a black walnut tree. As quickly as they seem to have appeared, they all seem to disappear. The last instar (molt) crawls to the ground and pupates underground, starting the process again the next summer.